Why put your relationship at risk when a robot could build the dang chair for you? An unexpectedly heavy cardboard box, filled with flat-packed formations. Seemingly superfluous pieces of particle board. A madness-inducing number of screws, nails, and washers, plus the lingering fear that one might be leftover. Even if you like putting together IKEA furniture, you’ve gotta admit that it’s no walk in the park. It’s the ultimate test of a relationship. And, now, it appears that it’s a good test for robots, too. A team of engineers at Nanyang Technological Institute in Singapore managed to program two state-of-the-art robotic arms to put together a STEFAN chair kit from a local IKEA, according to a study published Wednesday in the journal Science Robotics. The researchers employed two robotic arms for the task, like robots you’d find on factory floors. 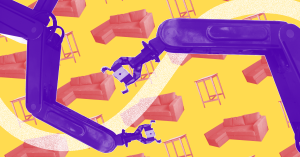 The individual pieces of the chair were laid out in a random pattern “with no special provisions for robotic assembly,” the researchers write. Using 3D cameras and force sensors, the pair of robot arms put together the chair in just over 20 minutes. Putting together an IKEA chair actually involves some very complex motions (who woulda thunk?). Inserting a tiny wooden peg into a tiny hole on one of the many scattered pieces of wood lying on the ground is no easy feat: the robots have to find where the peg is supposed to go, move it into position, and exert just enough (but not too much) force to put it in place. These industrial robots, though, normally work with very precise and pre-determined patterns — they were never actually meant to perform small movements while controlling the amount of force they use. So the engineers mounted force sensors on the robots themselves, which prevented poor STEFAN from turning into a pile of particle board shrapnel. While the feat of having two industrial robots assemble an IKEA chair is pretty impressive, there were some limitations to their process: the team had to hard-code the sequence of events “through a considerable engineering effort.” So it’s unlikely that we’ll have robots to build our IKEA furniture in the immediate future (seriously, at this point why not just pay a little more to get your furniture pre-assembled?). But both AI and robots are advancing so quickly that it’s not inconceivable we’ll have robots capable of assembling all kinds of furniture sometime in the future (that is, if we don’t find a way to 3D-print STEFAN instead). And couples all over the world will be better off as a result.